Film festivals are typically magnets for glitz, stars and media, but challenges within this particular sector of the industry are often lost amidst the parade of premieres and award events. Like the overall specialty film biz – not to mention the economy as a whole – festivals have faced leaner times in recent years as cutbacks from sponsors and a restructuring of the broader entertainment world trickled down to a festival industry that experienced an explosion of growth in the ’90s and early 2000s. The woes, challenges and opportunities of film festivals took centerstage at meeting of a broad cross-section of mostly U.S. fests, along with a trickle of others from Europe and Australia, last week at IFP’s Independent Film Week. Far removed from the fanfare typical of festivals, the setting was a windowless room at Fashion Institute of Technology (the H.Q. of this year’s Independent Film Week for the second year running) and the guest list was limited to festival organizers to allow for an open forum discussion that was technically off the record. Organizers from America’s largest festivals including Sundance and SXSW sat with so-called regional fests of various sizes as well as niche events including documentary, LGBT and Jewish festivals. 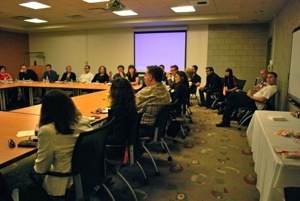 IFP’s Filmmaker Forum. Image courtesy IFP. IFP invited indieWIRE to exclusively observe the discussion under the proviso that nobody was quoted directly and that iW only report on the broader topics discussed. 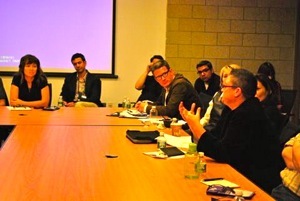 Topics ranged from the role of festivals in a period of fast-evolving distribution models, ideas for collaboration in a range of areas such as programming, screening fees and travel, while others called for festivals to have a frank discussion on the need for “premiere status,” which often precludes one festival from screening a coveted title in favor of another fest. Festivals repped at the gathering included: the Berlinale Forum, Big Apple Film Festival, Brooklyn Film Festival, Dallas International Film Festival, Gen Art, Frameline, Full Frame, the Florida Film Festival and Enzian Theater, Hot Docs, Mix, Naples, Florida, Melbourne, Newport Film, Rotterdam, Rooftop Films, Sarasota, Sheffield, Sidewalk, Slamdance, Sundance, SXSW, Woods Hole and others. Of course, VOD was a hot topic given the move by a number of festivals to embrace a model that often puts films into distribution concurrent with their festival screenings. One early skeptic admitted that he was proved wrong when he discovered that having a film on VOD ahead of his regional festival did not hurt fest attendance. “VOD, we know it doesn’t take away from our audience,” another fest organizer summarized. Beyond VOD, approximately half of the fests on hand said they had moved into some form of support for select films screening outside the fest. Festivals of varying sizes, including Toronto’s newly minted Bell Lightbox, as well as regional fests such as Mill Valley and the Florida Film Festival’s Enzian Theater operate venues year-round, which – theoretically – can support films and filmmakers approaching a non-traditional distribution model when the festival run has ended. New York’s MoMA is also a popular venue for films to find a particular audience that might appreciate work that has yet to find a traditional release outlet. While the discussion concentrated on ways festivals can help filmmakers,organizers also turned the informal chat toward how they might be able to support themselves through alliances and use of technology. One programmer called on festivals to collaborate on a collaborative website that pools titles lacking distribution, making them available for audiences to view for download. Taking the technology component one step further, another programmer suggested that a “members only” website could alleviate all festivals from the associated costs and time of some aspects of programming by allowing participating programmers to access opinions by colleagues on particular films being submitted. Other areas of collaboration were not necessarily in the best interest of a filmmakers’ bottom line. Smaller events and larger festivals alike complained about the costs of screening fees – basically honorariums or charges filmmakers or sales companies demand for a festival to screen a title. A number of festivals complained that filmmakers and sales companies (one particular Paris-based outfit received special citation) wrongly believe that festivals are hoarders of cash and are raking in money from ticket sales and sponsors on the backs of their work. To minimize expenses and to maximize economies of scale, a group of festivals in the East Coast have formed an early alliance to share resources and costs associated with bringing in films and filmmakers. They also hope their alliance will help them be able to demand more favorable policies for showing at their events while retaining their own particular flavors. The alliances could prove effective if they’re able to stay united. “We are non-profit organizations – cultural institutions. There’s a misunderstanding that we are hoarding a pile of cash and that we’re all in cahoots together and it’s not true,” said one organizer to laughs from the crowd. Related to money, one Southern festival noted its success in securing support from local government and businesses, even in a recession. Still, most agreed that economic impact studies are themselves expensive undertakings and providing support to local governments and businesses to back up the economic upsides of film festivals were often daunting undertakings. Some suggested that the IFP take on supporting festivals in providing data to help in their quest for local sponsors.